WOW! 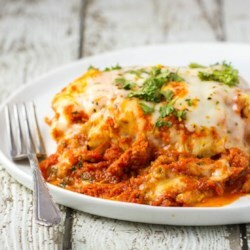 This really is World's Best Lasagna! From reading all the reviews, I made these changes: Added an additional 1/2 pound of ground meat, omitted the salt, doubled the onions, all the spices, the parsley, canned tomatoes, paste, and sauce. I also doubled the filling ingredients and made three layers instead of two. Everyone raved about the lasagna and I have sauce left over for another use. SIDE NOTE: For anyone who thinks they don't like ricotta cheese: Buy it at an Italian market. Brands such as Sierra or Polly-O. There is no comparison to the taste or texture of supermarket brands. I think that's why I see recipes with regular cottage cheese instead of riccota. I don't use supermarket riccota under any circumstances, it's just plain nasty!